TRUTH is the New Black | The Secret to Writing is WRITING! "THE SECRET TO WRITING...IS WRITING"
Pat Tobin is a writer + screenwriter + photographer. He's funny, creative, brilliant and I consider him a humorist, even if he doesn't. The bottom line is this... Pat Tobin gets PAID to be a writer! How fantastic is that? Pat will be sharing what it really take to be a writer and and why so many people 'say' they want to write... but don't! We'll be talking about how he got to where he is now, what writers block is really about, what 'he' does to get on the other side of crippling self doubt and why 'sticking with it' is SO worth it. Join us. You don't want to miss this! On a personal note, Pat lives in Long Beach with his husband Joe. They share a vaguely unwholesome obsession with Margaret Keane, that predates the movie starring Amy Adams. His most recent work was writing the screenplay for CAKE. A script he adapted from his own 'short story' (also called CAKE). Pat's screenplay was ultimately turned into a movie and was, directed by Daniel Barnz and stared Jennifer Aniston. CAKE premiered at the 2014 Toronto International Film Festival and in 2015 it won Best Screenplay at the Shanghai International Film Festival. The film was also honored with a Voice Award by SAMHSA*. Prior to the screenplay becoming a film, CAKE won Showtime’s 2013 Tony Cox Screenplay Competition and the 2013 CineStory Screenwriting Fellowship. 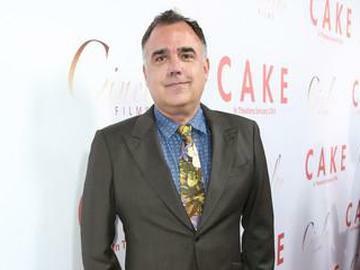 CAKE was also included in the 2013 Black List, a yearly survey of entertainment executives’ favorite unproduced scripts. Pat's writing (fiction + creative non-fiction), short stories and essays, have appeared in numerous publications and anthologies and has won countless awards. And in addition to CAKE, his film credits also include his script NO EASY WAY, which was executive produced by Oscar-winning editor Marcia Lucas. It premiered at SXSW and was awarded a Crystal Heart Award at the Heartland Film Festival. Lastly (but certainly not least) Pat co-wrote a cat humor book called Petted By The Light. It's no longer in print but can be found on Amazon for a song. *SAMHSA: a program that recognizes consumer/peer leaders and television and film professionals who educate the public about behavioral health through their work. Due to the curated provisions + customized details we make for each and every event (goodie bags + surprise treats + food + beverages + seating + venue) tickets are non-refundable, but they are transferable to another person. Just send an email to: TRUTH@ShawnMarieTuri.com. In the subject line reference: 'Guest Name Change' and let us know who will be taking your place so we can get them on the list. Thank you and we look forward to seeing soon.